Book discusses the art of aviation photography and is a practical how-to guide to photographing airplanes for anyone from air show enthusiasts to those aspiring to be professional aviation photographers. 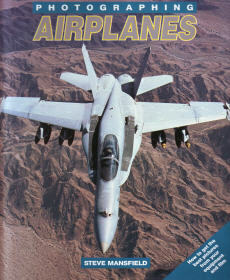 Book discusses equipment, film, composition, and technique as well as furnishing important information on where to access military, vintage, and commercial aircraft. 160 pgs, SB, 9 x 12, 100+ color photos.